Bayern Munich president Uli Hoeness has slammed Karim Bellarabi for a “sick and stupid” foul on Rafinha, claiming that the Bayer Leverkusen man should receive a lengthy ban. 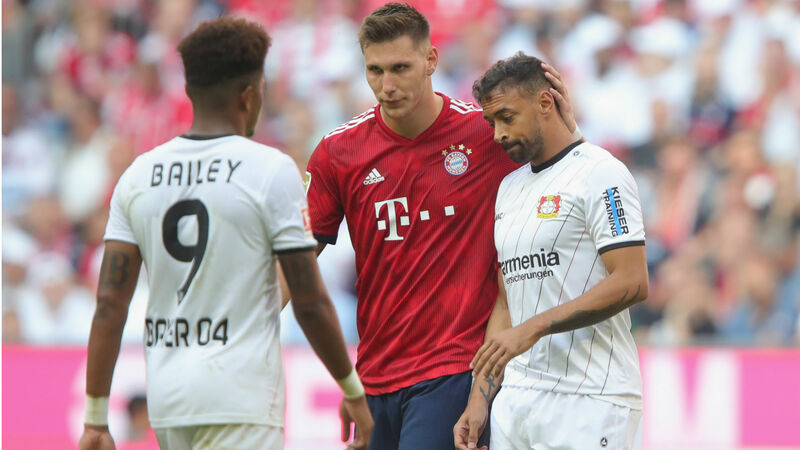 Bellarabi – a second-half substitute during Leverkusen’s 3-1 defeat at Allianz Arena – was on the pitch just seven minutes before he lunged in on Bayern’s full-back, rightly receiving a straight red card. Rafinha had to be helped from the field by Bayern’s medical staff, and although Niko Kovac was unsure as to the extent of the injury, Hoeness did not hold back in his criticism of the Germany international. Bayern had suffered another injury blow earlier in the game – Corentin Tolisso, who netted a 10th-minute equaliser to cancel out Wendell’s early penalty, having gone off with a knee injury, and Hoeness fears that the France midfielder may be facing a long lay off. “It looks so bad. I think it’s the cruciate ligament,” Hoeness added. Despite the injuries, Bayern made relatively light work of Leverkusen, who took the lead when Wendell converted from the spot in the fifth minute – Manuel Neuer having pulled off a brilliant double-save to deny Kevin Volland from the initial penalty, only for referee Tobias Welz to order a retake for encroachment. But Tolisso’s well-taken effort soon had Bayern on level terms, with Arjen Robben putting them ahead nine minutes later with a stunning volley. James Rodriguez would add further gloss to the victory late on, and Kovac – whose attentions will now switch to Wednesday’s Champions League clash with Benfica – was satisfied by his side’s confident performance. “I would like to congratulate my team. We recovered from the early goal very quickly,” Kovac said.